As Europe tightens its borders to stem the influx of refugees and migrants crossing the Mediterranean Sea to Europe, a growing surge of people from African nations seeking new routes to flee poverty, war and persecution. Using a stone, Ahmed Ali Hassan scraped away at the side of the container truck until he made a small hole, and putting his parched mouth to it, gasped for air. The overcrowded truck carrying nearly 100 migrants, many from Africa, took turns to breathe in pockets of dry air as the truck rattled through rural Nicaragua. One man from Eritrea had badly swollen fingers, a sign of severe dehydration. "We all thought we were going to die," Hassan, a Somali, told the Thomson Reuters Foundation as he recalled last month's journey. "We were not treated with dignity," said the 24-year-old university student, who declined to give his real name. As Europe tightens its borders to stem the influx of refugees and migrants crossing the Mediterranean Sea to Europe, Hassan is part of a growing surge of people from African nations seeking new routes to flee poverty, war and persecution. He is lucky not to have suffocated. Immigration officials in Mexico's Veracruz state found four migrants dead in a truck that smugglers had abandoned. The routes to Europe have become more difficult, said Claudette Walls, head of the field office for the International Organization for Migration (IOM) in Mexico's city of Tapachula. "What's happening in the Mediterranean is that it's becoming more and more hazardous and difficult to take that route," Walls said. "Through Latin America coming all the way up to Mexico and then on to the U.S. has become another route," she told the Thomson Reuters Foundation. They join the hundreds of thousands of Central American migrants fleeing poverty and gang violence every year, and who have been using the well-trodden route for decades. Immigration officials first noticed African migrants arriving in Mexico in 2013, when around six trickled in a day, mainly through Tapachula along Mexico's southern border with Guatemala. Hundreds now turn up every day. Last year between 150 to 700 African migrants arrived per day at Tapachula - with a total of 19,000 migrants arriving from Africa and Haiti in 2016 - according to Mexican government figures. This influx is expected to continue, Walls said. Mexico has also seen a tide of Haitians coming through as they seek a better life in the United States. Thousands of Haitians who had lived in Brazil are leaving because of the country's economic recession. Experts also say the surge north reflects a push by migrants to reach the United States and reunite with relatives before U.S. President-elect Donald Trump takes office on Jan. 20. During his campaign, Trump took a hardline position on immigration, including a pledge to build a wall along the U.S.-Mexico border to keep out illegal immigrants. Like African migrants making the treacherous passage to Europe across the Mediterranean Sea where thousands die each year, the journey through Latin America is also perilous. Most migrants say that at some point along their journey they have been robbed and or attacked by local gangs. Paying officials bribes starting at $20 to allow them to continue their passage is also commonplace, migrants say. Jose Ramon Cancino, head of migrant affairs at the human rights commission in Chiapas state, where Tapachula is located, said his office received 3,000 complaints last year from migrants, most involving extortion and abuse by police. Hassan said he and a group of migrants from Africa and Asia were robbed at gunpoint in Costa Rica by local criminals. "They checked us one by one. Even if we had anything in our mouths. They take everything," Hassan said. "I kept my shoes only because I'm a size 43 and the guy (thief) was a size 41," said Hassan, sitting on a bench at a budget hotel known as Mama Africa in downtown Tapachula, which has become a popular resting place among African migrants. Most migrants say the worst part of the journey so far has been the gruelling six-day long trek across the Darien Gap - a mountainous rainforest wilderness that straddles Colombia and Panama. Some die on the way. "I saw skeletons in the jungle," Hassan said. 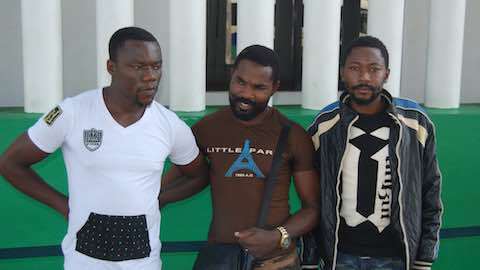 Another African migrant, Chofong Betrand and two friends from the Cameroon, also survived the jungle odyssey. They arrived in Tapachula last month. Betrand hopes to reach the northeastern United States to join his mother who already lives there. Betrand, who belongs to Cameroon's minority English-speaking people, said he was briefly jailed by state security forces. "We want independence. French Cameroon take everything for themselves," the 21-year-old university student said. "There's fighting. They don't want to give us our independence," Betrand said, as he queued for three hours outside the National Migration Institute hoping to get a temporary 20-day permit. The hardest bit of the journey is yet to come. Migrants still have to reach the United States border, and then cross it without getting stopped by border agents. "A mighty hand is guiding us," Betrand said. "No one does this journey twice." Africa - "African Migrants Brave Latin America Trek For U.S. Dream"